The InfoDot costs a fraction of what it costs to laser engrave an item. It is less than 10% of the cost of a laser etched solution. The InfoDot solution is proven and endorsed throughout the world as The Solution. The process of applying an InfoDot is simple and can be completed onsite within minutes. Your inventory of instruments do not need to be sent off site to be etched. You do not need to speed thousands of dollars training your staff to operate a laser. 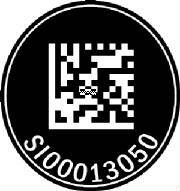 Laser etched instruments require very expense scanners to read the barcode. These scanners cost 300% more than our required scanner! InfoDots come in various sizes to meet the size constraints of your objects. InfoDots are designed to withstand any normal wash and autoclave cycles. Our experts will work with your staff to insure success. InfoDotsTM as your solution will not tax your budget or your staff. The InfoDotTM is proof that size doesn’t matter. This label uses DataMatrix ECC200 bar code to encode as much data as a traditional bar code while taking up only one-tenth the space – making the InfoDotTM the ideal identification solution for small parts tracking. The relative size of the label also lends itself to other applications where a smaller label is preferred such as evidence tracking or fixed asset tracking for items with which a larger bar code label may be considered obtrusive. The InfoDotTM resists solvents, caustics, acids, and temperatures of nearly 500 F. The InfoDotTM also discourages theft or tampering and is non-transferable. 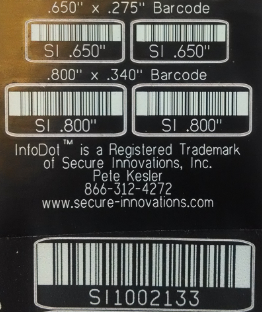 Plus, because of the high redundancy within the DataMatrix ECC200 Bar Code Symbology, the InfoDotTM is still readable when as much as 60% of the image is damaged. Contact us to review a sample sheet of our InfoDotTM sizes. In addition to our radial InfoDotsTM we produce several lineal barcodes in the same tested and proven material in various lineal code 128 sizes. While we stock several standard sizes including .650; .850; 1.0; 1.25 and 1.50 inch we can also produce custom sizes to meet your needs.